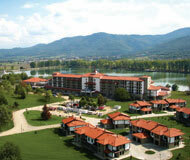 The 4-star Hotel RIU Pravets Resort is located on the lake in the pleasant town of Pravets, just 40 minutes drive from Sofia. It is a luxury Resort with a total of 242 units – 212 rooms, 10 Studios and an Executive floor with 10 rooms, 6 One-bedroom and 4 Two-bedroom Suites offering all features and services to satisfy the most demanding requirements of the leisure and business traveler. Two fine restaurants, the Lobby Bar and a stylish Piano Bar offer the hotel guests a wide range of culinary temptations and drinks. On the hotel’s premises there are a Fitness Centre and relaxation area, equipped with ultramodern technology. The Spa centre covers an area of over 3000 sq.m and offers a variety of healing therapies and massages, steam baths and saunas that are unique for Bulgaria. An indoor swimming pool and a great number of facilities and services such as Salt steam bath, Herbal bath, Salt lake cave, Rock Sauna, Bio Sauna, Laconium, Tepidarium, Lifestyle Showers, ice room, Russian sauna a variety of traditional and exotic massages, Jacuzzis, state-of-the-art fitness center, and large relaxation area.